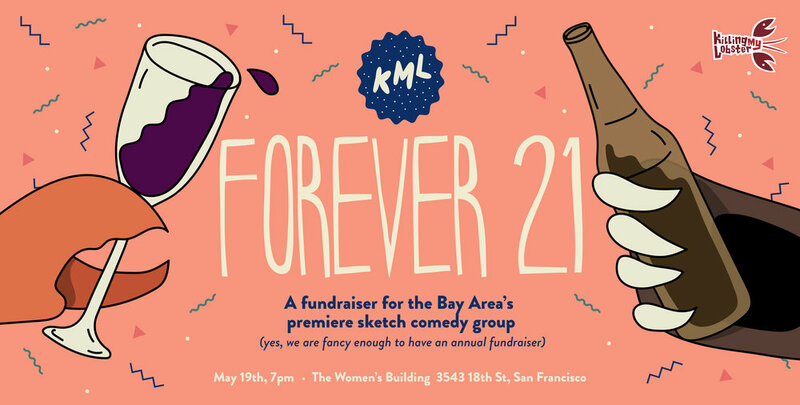 Now in our 21st year, the Bay Area's premier sketch comedy group, Killing My Lobster continues to create fast, smart, fearless sketch comedy that makes people laugh. Additionally, with programs like our Diversity In Comedy Fellowships, and our annual collaboration with 826 Valencia, teaching writers ages 8-11 how to write sketch comedy, we're consistently doubling down on our commitment to the local, Bay Area community. Come celebrate 21 years of comedy, and help us prepare for 21 more! - An array of tasty bites! - All the beer & wine in the world! - Live performances of some of our favorite 2018 sketches so far! - Our big ol 2019 season announcement! - And probably several impromptu dance parties! Grab a ticket for yourself, or snag a whole table and bring your *fun* friends!